When you think barbecue, beef and pork are the first proteins that come to mind – as they should be. Real Urban Barbecue (610 Central Avenue #177) in Highland Park features another protein that is unique and absolutely worth taking a rain check on the pulled pork and brisket – both I might add are also delicious at R.U.B. Smoked turkey breast. Slow smoked for hours, this turkey is gorgeously tender and surprisingly juicy. Flavorful with brine and smoke, the meat is a delicacy that looks fantastic but I swear it tastes even better. Jeff Shapiro, a restaurant veteran and owner of R.U.B traveled across the country learning the best techniques for smoking barbecue in just about every ‘que region – the Midwest, the Carolinas, Kansas, Kentucky and Tennessee. He also hit the competitive BBQ circuit, known as Dr. Deckle & Mr. Hide and won numerous trophies. The quality is serious and the time is taken to prepare every chop and slice of meat to perfection. 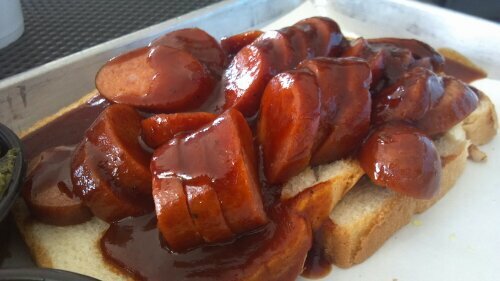 Slow smoked Texas Hot Links come out covered in zesty spicy tangy sauce that perfectly complements the smoky and flavorful meat. Loaded with spices and herbs the links received two thumbs up from my father whose opinion I trust when it comes to judging great food. Two sides are included. 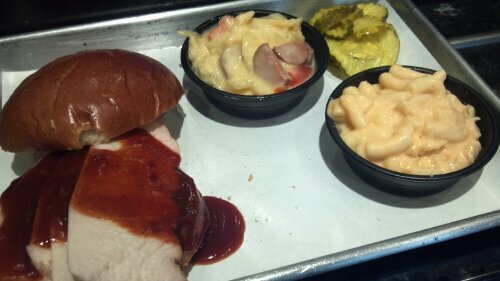 Franks and potatoes are a staple here as well as the mac and cheese. Both are hot and creamy. Nice robust and rustic seasoning in the “frank” which is definitely tastier than a regular hot dog. 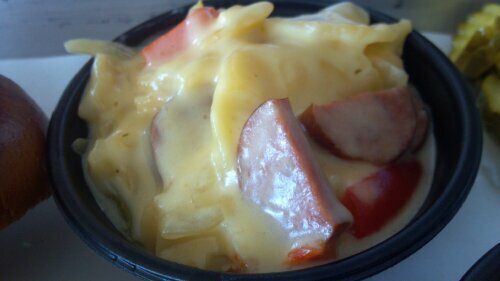 The mac and cheese is probably a three cheese blend. There’s nice richness and a sharp finish. Tastes much more complex than it looks on the plate. Have your order ready when you reach the counter because it’s usually busy and the “meat man,” your first stop down the hot line in which you assemble your plate, well he waits for no one. 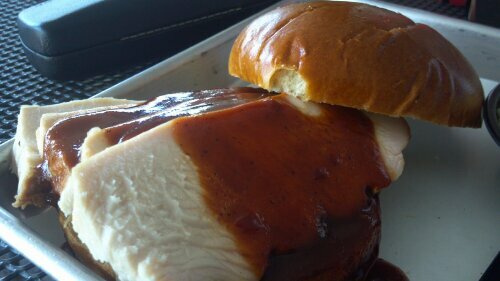 I say try the trio and make sure turkey is one of the selections – then you can try a little bit of everything Real Urban Barbecue has to offer.